The Best Vegan Lunch Sandwich in NYC?.. 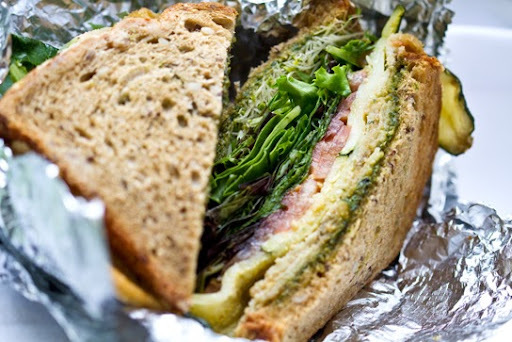 I've searched all over downtown NYC and to me, the "Vegan Angelique" from Cafe Angelique in NoHo is one of the best vegan lunch sandwiches to be found. I simply had to share this sandwich inspiration with you guys. See what's in it and how you can try and replicate it in your own kitchen!.. I skipped over to Cafe Angelique today. Not even the windy rain could get between me and my vegan sandwich craving. 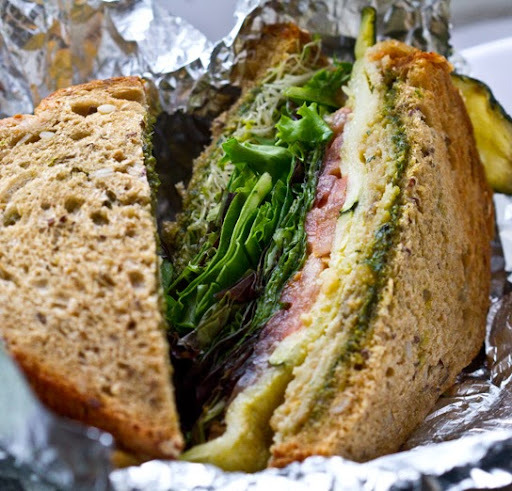 I've tried and tasted a wide variety of lunchtime sandwiches here in NYC. A few faves include the Hummus Sandwich from Murrays, the Smokycado wrap from Blossom du Jour, the Cauliflower Chickpea wrap from *Snice, the Mushroom Health Sandwich from Aroma, the Black Bean Hummus Tartine from Le Pain Quotidien, the "Vegan Sandwich" from Think Coffee, the vegan BLT from Teany, my fave vegan dosa food cart guy and I could go on and on. 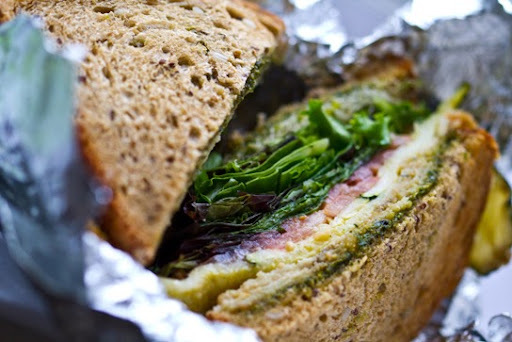 But hands down, my favorite vegan lunch sandwich (well, for today anyways) is the "Vegan Angelique". It's like a giant salad stuffed into a sandwich. I love it because it is stuffed with good stuff! Avocado, sprouts, a huge handful of baby greens, tomato, olive tapenade, olive-oil fried/breaded eggplant, zucchini and a hint of basil pesto spread. (And yes, I've asked several times to make sure the pesto is vegan. They always say yes.) All the ingredients are piled between two soft slices of Seven Grain Bread. They always make my sandwich fresh and lightly toast it for me. Yum! I always get my sandwich at the NoHo location. So I can't vouch for the sandwich from the other locations. Make it! You can easily make this sandwich at home. Start off with good, fresh 7-grain sandwich bread. Add whatever veggies you'd like then those two secret ingredients seem to be the olive tapenade and the pesto spread. Also, that thinly sliced and sauteed breaded eggplant and zucchini. Try making it with my vegan Cheesy Walnut Pesto Spread. Or my Lemon-y Pesto Spread. Or my Spicy Rockstar Pesto recipe. This vegan sandwich just rocks.